With both newer and better composition, glass is being used in more interior design projects, staircases included. Providing an innovative, fresh sophistication to homes and commercial buildings, glass is comprised of varying colors and textures such as transparent and opaque varieties, along with frosted, textured and smooth. Whether paired with wood or metal components, or accented with lighting, some of the most stunning staircases today are composed of glass. Perhaps the greatest concern when it comes to glass staircases is durability. Can they withstand day-to-day traffic? The answer is yes. The design professionals at Southern Staircase/Artistic Stairs utilize different forms of tempered or “toughened” glass. Once the glass has been cut into its desired size, controlled thermal and/or chemical mechanisms are used to boost the strength of the glass. What’s more, the glass is less prone to shatter. Therefore, from spiral stairs to floating glass, our custom-designed staircases provide aesthetic appeal and functionality. 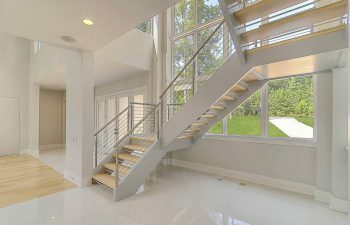 For homeowners with a unique floor plan, or for those hoping to integrate different rooms, a glass staircase maintains a light, airy existence. Consider a glass railing or glass staircase wall. The transparency of the glass allows for unobstructed views into other rooms and windows. The living space appears open and bright. For darkened areas, however, glass stairs and/or railings offer a new perspective, highlighting design elements that were once overlooked. Finally, for small, narrow spaces, a glass wall is an excellent choice for an open look. When considering glass for your staircase, it’s important to look at other aesthetic characteristics that will compliment your new design. For example, do you have skylights in your home? Will the staircase be a focal point in your space? Do you want to make use of light in your staircase project? Are fixtures in your home made of steel or brushed nickel? Will your new staircase be an extension of the style you currently have? With limitless design options, the team at Southern Staircase/Artistic Stairs is committed to helping clients express their individual style through a design process that begins with a discussion regarding their unique vision. For those looking for inspiration, our vast portfolio features a number of designs and materials, in many different formats. Once your individual staircase project is determined, we’ll explain installation services, and structure those to fit your needs. Finally, we will ensure that your staircase is code compliant. At Southern Staircase/Artistic Stairs, we pride ourselves on delivering a turn-key design with a flawless fit and finish. Contact us today to discuss your glass staircase needs!